ARA Audio Random Access, SDK/library from Celemony. Celemony Software has announced “ARA Audio Random Access” – an extension for existing audio plug-in interfaces designed to expand the communication between plug-in and DAW, affording the plug-in musical access to the audio data. Developed by Celemony in collaboration with Presonus, ARA presently connects the Presonus DAW Studio One 2, shipping this fall, with the current Versions 1.3 of Melodyne. Other manufacturers and products will follow. As an extension of the existing plug-in interfaces, ARA opens an additional channel of communication through which the DAW and plug-in can exchange information about the audio file, tempo, pitch, rhythm and much more, which is designed to allow them to work more closely. The plug-in is closer to what is happening in the DAW; the DAW, for its part, is able to integrate the plug-in as though it were part of the DAW. An example of the new workflow with ARA is the interaction between Presonus Studio One 2 and Melodyne. With ARA, Melodyne is integrated into Studio One and serves there as an alternative to the normal waveform editor: audio segments are opened directly in Melodyne and follow automatically when moved and copied as well as changed in tempo or time signature. 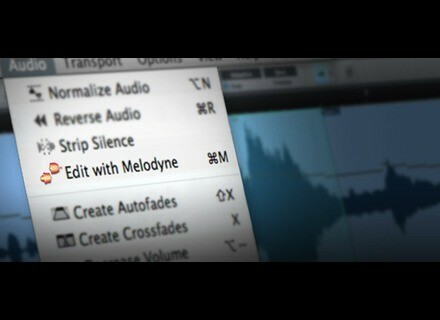 Studio One, for its part, uses Melodyne for time stretching and to derive information about the musical content, i.e. for Audio-to-MIDI via drag-and-drop and for the evaluation of Melodyne's tempo recognition." Soniqware T3 (Time To Trigger) SoniqWare has released T3 (Time To Trigger), a stereo MIDI trigger engine that listens to incoming audio, detects new events, and sends MIDI notes with appropriate dynamics and pan to control a drum sampler or another synthesizer, live or in the studio. MARVIN Releases reTromine and Updates HS9 MARVIN has released reTromine v0.1 and updated HS9 to version 1.1.